The vision for a thrift store was born from the need to utilize donations to the House of Care to the maximum benefit of the community. A thrift store with good merchandise at reasonable prices would reach people beyond those being served by the House of Care. It would aid all of the local area struck by the bad economy. 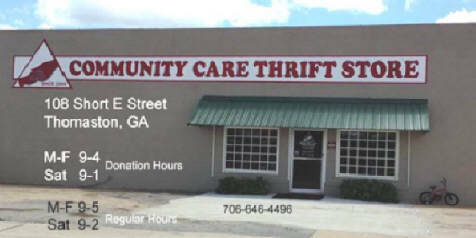 A year of prayer and research culminated in August 2009 when the Community Care Thrift Store opened its doors to the public. Our location had served as a privately owned business for many years and has provided us with a loyal customer base. As word spread, business has increased allowing our ministry to benefit area families through affordable merchandise and monetary donations to local service organizations. We invite other churches and organizations to become involved with this ministry through prayers, support, volunteers, and donations. Our purpose is simple: "It is not what we do, but the difference we make" God is good and faithful!